Wood is resilient. lt does not shatter like glass when you drop it. It does not chip when you strike it. Though it may dent or fracture under the same aforementioned abuses, the scars can generally be repaired to the original appearance. I have lost a few over the years that I deemed were not worthy of the time it would take to repair them to their original form. But before scrapping the work altogether, I begin looking at the piece with new eyes. I do this in consideration of the fact, that after all, I begin all of my work from a shape I didn’t produce, but one that the tree did. Generally that shape is the same repetitive cylindrical form that I must re-purpose to my own whim. So when I come across a shapely form of a crotch or stump it excites me to go places not yet traversed. I sparks my imagination. I look at creativity as not being without an analytical approach. I believe that man’s inspiration is at its height when confronted with a problem. Problem solving is sort of like putting the creative part your mind on steroids. Which brings us to the sculpture pictured. I had an unfortunate shock last month when picking up some of my pieces from a gallery show, to discover that three of my works had cracked from the stress of the dry environment. In all my years putting work in shows like this, I have never had it happen to even one of my pieces. So confronted with the problem on this piece I began by simply carving out the cracks to a point where they were inconspicuous. 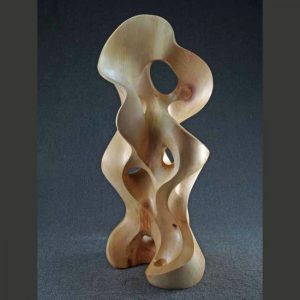 Since almost all work carved from a tree trunk will generate some stress cracks from drying, I work from the rule that they should not be so conspicuous as to overpower the overall visual impact of the form with their presence. But visually, when the cracks are carved away, the very removal of the wood changes the balance and order of the form. It’s not unlike the “four legged stool syndrome, “cut the end off one of the legs and you must cut the the rest of the legs to make it balance it again”. So the piece you see before you, though it appears very similar to to the original, is entirely new, and it took me as long to make the corrections as it did to carve the original. This piece will sport the same selling price as the original did though I now have twice the time in it, So what did I gain? the satisfaction of arising to the challenge, and the delight that I like the result better than the original. There was after all, nothing salvaged here except maybe a piece of wood. Timewise I could have come out the same if I had simply discarded the original and started over in a new piece of wood. After all of this, in the renaming the new sculpture, of course “Metamorphosis” came to mind. But that being a tired and overused convention for art titles I decided on “Circumvention“, which still works with what I was attempting to say with the original but with an added wink to how it was derived.